I've used 6 colours that I have on hand for a bright, bold look, but this could easily be adapted to 3 or 4 colours, tonal or complementary. Note: All we are doing here is making triangles and joining them together. So have a little think about the approximate placement of your different colours for your design before you get started. 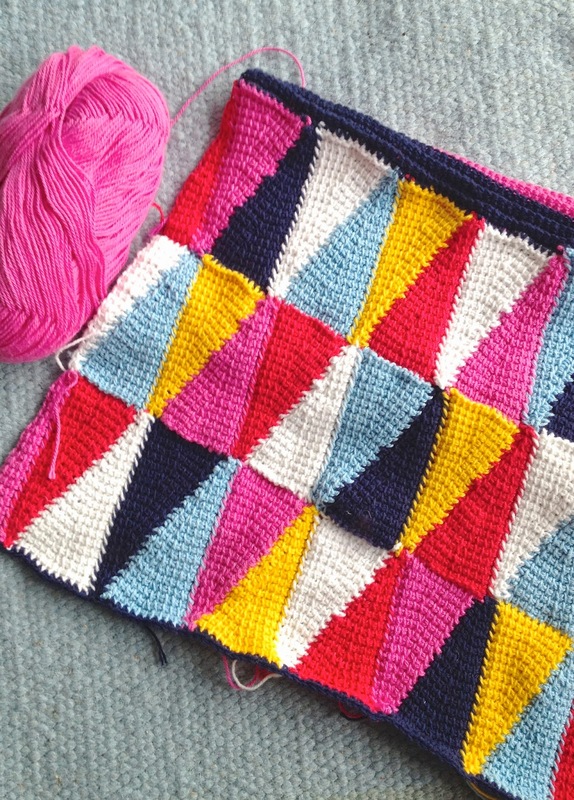 Or, if you're happy with your colours, do as I did and go completely freestyle, choosing your next colour one triangle to the next... feeling it out as you go... Just make sure you have enough yarn of each colour up front! This pattern uses 45 triangles and 6 half triangles (to square off each row) for each side. You could do this on both sides, or if you want to mix it up as I have, use double crochet stripes for the back. Chain 13 in any colour of your choice. This is going to be the base of your triangle (i.e. the edge where my fingers are below). Tunisian crochet your first 2 rows (that means back and forth x 2). On your next row decrease one stitch by crocheting 2 posts together, that is: when you're picking up your stitches to add onto your hook, hook through 2 posts and pull your thread through - you've just decreased. I've decreased in the centre, to keep my pattern nice and symmetrical, so for this first decrease I've picked ups posts 6 & 7 for my decrease. You can see this in the pattern below, just above my middle finger - the 2 posts together form a little triangle. 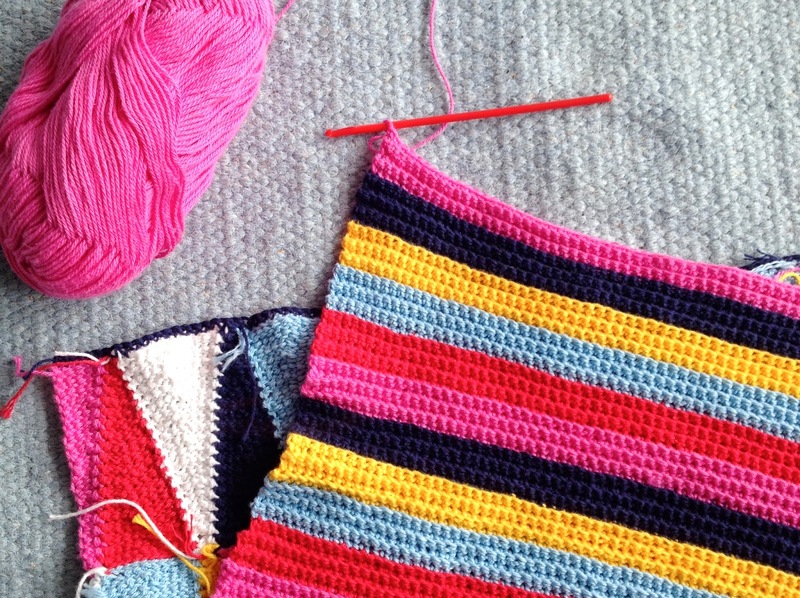 Keep crocheting back and forth, decreasing one stitch on every other row. Keep your decrease stitches in the centre to keep the pattern nice and even. When you're down to 3 stitches on your hook, pull your yarn through all 3 to cast off. To do this.... when starting your next triangle, make your first chain through the point of your first completed triangle. Continue your chain stitches, so you have 13, just like previous. 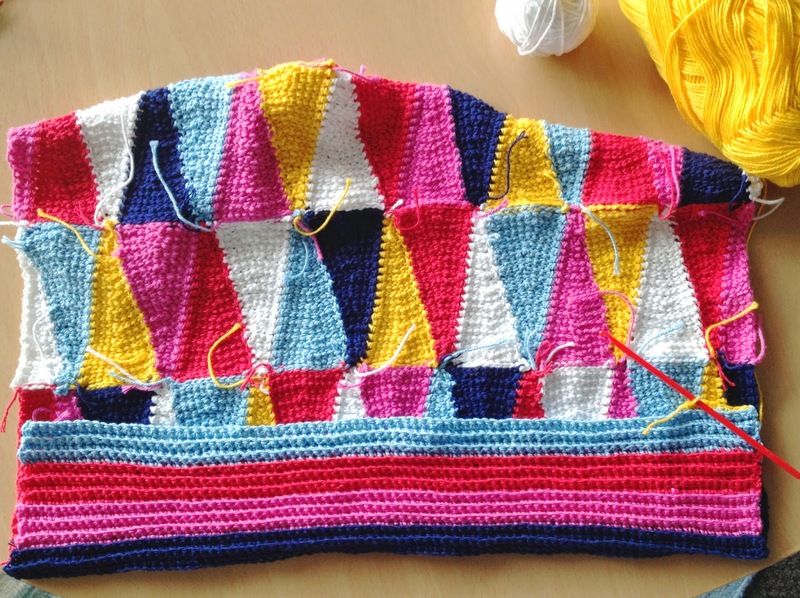 Then continue with the first part of your tunisian crochet, picking up your stitches. When you come to the end of this first row, you'll meet with your previous, completed triangle, so pick up your last stitch through the end / last stitch of that triangle, so that the 2 become attached... then complete your row, dropping off your stitches as normal. Simply keep attaching in this way as you go. As you can see above, this gives a nice rolled looking edge at the join. Double crochet (that's English DC) along one long edge of your front cover and tie it off. You can see above, that I've done this in Navy - this will become the top edge of your cushion. This really is just neaten this edge up and make it easier to join your two edges together later, to close up your cushion. I've used Navy above. Then, DC along your top edge... you can either keep going from here, or tie off and treat this make this back side of your cushion completely separately - its up to you. I've continued on in one piece for mine. DC into the back loop of the previous row only (as opposed to through the complete chain), to give a nice horizontal ridged effect. Now the sides are a little loose for joining together tiredly, so I've gone around the sides with another row of DC. I've "eased" the edges in a bit to tighten these up, so that I'm DC 4 stitches to each band of colour - this will give a neater finish on the completed cushion. A little bit lumpy, but I'm sure I can beat the lumps out of it before long.